Thirty-Nine. It sounds so… penultimate. It’s a transition number, just leading into the next. It’s a placeholder… a stepping stone. And it’s so meaningless. There’s little that’s particularly interesting about the number 39, except that it is the number just before fffff…foorrrrr… well, the number that follows. In religion, Jesus was scourged with 39 lashes at the pillar before he was crucified. The law stated that a criminal was sentenced to “40 lashes minus one,” or 39, because the belief was that 40 lashes would actually kill a man. In other words, 40 is fatal. Lovely. Also in religion, there are 39 books in the Old Testament. In arts and entertainment, Jack Benny claimed to be 39 years old for over 40 years. Sounds like a good plan to me. The bands The Cure and Queen both recorded songs with the title of “39.” Queen’s song coincided with the 39th song released in sequential order on their albums to that point. In history, the U.S. Constitution was signed by 39 different people. The number of Scud missiles that Iraq fired at Israel during the Gulf War in 1991 was 39. And at age 39, Martin Luther King was assassinated; also at age 39, Amelia Earhart went missing. So what does all this mean? Nothing, really. Except that today I am 39 years old, and I really don’t feel a day older than 29, or even 19. (OK I do feel a little older than 19.) I’m happy and healthy and in a much better place in my life now than I was even a year ago. I feel optimistic about the year ahead, and am hopeful for some wonderful things to come my way in 2010. Today, I will be spending my birthday with 128 of my dearest friends, on stage, singing my heart out in the Chicago Gay Men’s Chorus’ holiday show, “Christmas Follies.” If you’re around the Chicago area and have a few bucks and a couple hours to spare, stop by for our show at 3pm or 8pm and celebrate with me. Because, as one of our songs says… I can’t celebrate without you! You can find out more at www.cgmc.org. Thanks for being with me for another year. Looking forward to the next 39 years! April 28, 2008 by Rick, posted in Chorus, Friends, Good things! This weekend I joined my fellow chorus members for a gig at Illinois Wesleyan University in Bloomington, IL. We sang there a few years ago with a Lesbian/Feminist chorus named Amasong and had such a great time and were so enamored with the audience, we couldn’t wait to go back. The fact that we haven’t been back since is probably just because Amasong mixes up their guests every few years– but we did get the call this year and about 50 of us made the trip down. Bloomington (also known as Bloomington-Normal because of the close proximity of neighboring town Normal) is a very collegiate town– aside from Illinois Wesleyan, there is also Illinois State University and two smaller community colleges. So for a small-ish town, it is pretty lively, especially when students are around. After the show, a few of us decided to stay overnight, so we headed out to The Bistro, the only gay bar in Bloomington-Normal. The Bistro is a fairly small place, but it was big on fun. It’s owned by a lady that everyone calls “Mama,” and “Mama” is quite a lady. She feeds everyone shots and good times and drinks from a special jug of tequila she calls “Mama’s Milk.” It’s raucous and fun and creates a really great atmosphere for a party. So two shots and two $2.50 Long Islands later (I love the south suburbs! ), I was on the dancefloor cutting a major rug. The tunes were fun and my friends and I were all over the place. We were enjoying a great disco tune when all of a sudden this cute young collegiate looking boy appeared in front of me. “Hi, my name is Pete, what’s yours?” I said, “Rick, nice to meet you Pete!” and we started dancing together. He asked me where I was from and I said “Chicago,” and he responded that he was a student at ISU. We got a little closer, and he touched me a few times in a few places, and I touched him in a few places. Just when I thought maybe I might sneak in some kissing action, a couple of his friends stumbled by and pulled him away. I figured maybe I’d see him again, but that was the last I saw of cute Pete. So while it didn’t turn out quite as I had hoped, it was still pretty nice to know that I’m not entirely invisible to guys. Especially cute ones with nicely shaped arms and tight-fitting T-shirts and big green eyes. So as far as I’m concerned, that was a step in the right direction for me. I left the bar feeling more confident and more upbeat than when I walked in. And there was a bit more of a lilt in my step as we walked away for the night. Unfortunately, we weren’t on TV, but one of the guys in CGMC recorded our performance on WGN Radio (AM 720) and transfered it to a YouTube video. There isn’t much to see– but here we are!! The ROAR you hear at the end are two Air Force jets flying over the stadium just as we reached the end of the anthem. It was QUITE a thrill!!! 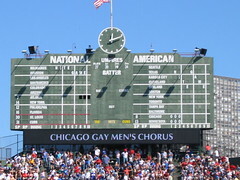 Tomorrow, Saturday, September 22, at 12:05 pm Central Time, the Chicago Gay Men’s Chorus will once again take over Wrigley Field to sing the Star-Spangled Banner before the Cubs game. This is the fourth time in five years we are singing, and the game will be broadcast on WGN TV, so there is a really GOOD chance we’ll be televised this year! Wish us luck! And cross your fingers that we’ll be on TV!